Cedar Mountain Commons is a not-for-profit independent and assisted living retirement community, centrally located in Newington, Connecticut. Tucked into the serene landscape at the base of Cedar Mountain, residents are just a short distance from Market Square, which features many local shops and restaurants. At Cedar Mountain Commons, residents are able to maintain their independence while living in the safety and comfort of a service-rich environment. Opened in 2001, this monthly rental community is owned by Hartford Hospital & Jefferson House as skilled nursing facility and rehab center and located on the Newington campus. 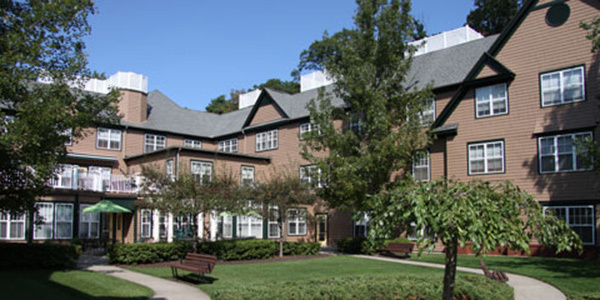 It is one of the few hospital-supported senior living communities in Connecticut. Our Assisted Living Communities offer you and your family peace of mind knowing that assisted living is available within your apartment should the need arise. We offer seniors an independent environment with all the benefits of a full-service community. At Cedar Mountain Commons, residents and their families benefit from something very special - peace of mind. Our caring team is committed to providing a high level of professional excellence, innovative programs and personal service. Use our Take a Moment to Compare worksheet to compare your current monthly living expenses with what your living expenses would be at Cedar Mountain Commons. For monthly rental rates, Independent and Assisted living package details, floor plans and a Take a Moment to Compare Guide, visit us, or call 860.665.7901.